The perfect bedside companion, the Hans Bedside Table is small in size, not in style. Match it with the rest of the Hans Collection, which includes a matching range of furniture pieces for the home. 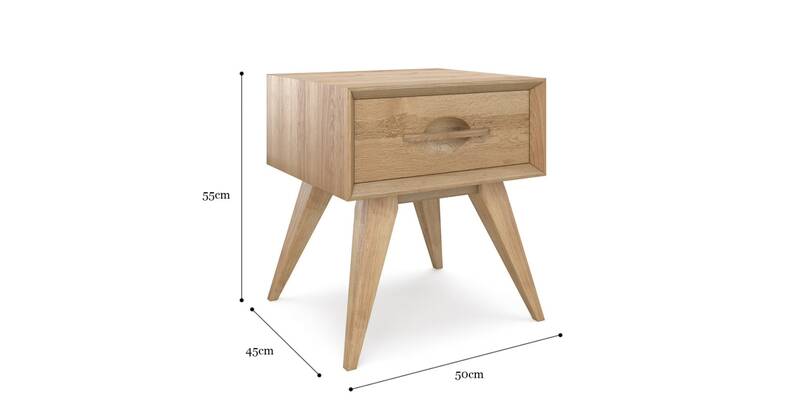 As functional as it is stylish, the Hans Bedside Table has a generously sized drawer for concealing items. Keep a lamp or book close at hand on the table's polished surface. The Hans has been designed to last, using carefully sourced materials, and will be looking great in your home for years to come. See more bed and side tables available from Brosa. A celebration of the beauty of wood, the Hans highlights its natural grain, and has a neutral palette that works well in a variety of interiors.